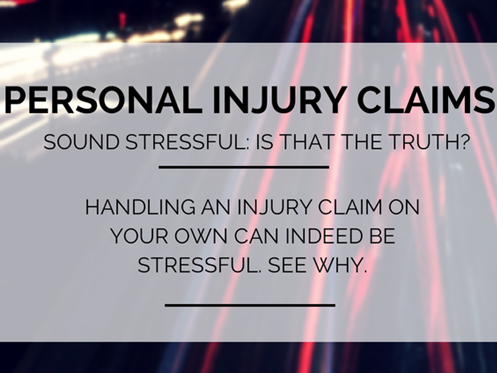 Personal injury claims sound stressful, is that the truth? Personal injury claims can be stressful, especially if your injuries are substantial. Dealing with the adjuster for the at-fault party’s carrier can be stressful and challenging in and of itself since the adjuster’s job is to pay you as little as possible (no matter how nice they might seem). Getting property damage addressed early can be challenging if the adjuster claims to be “investigating” liability or fault and you need a replacement vehicle. However, besides dealing with the adjuster, the impact of one’s injuries can be equally, if not more, stressful. Finding the right medical providers can be an issue, advancing the costs of any medical co-pays or deductibles if not treating on a lien, can be taxing. Lost wages can cause financial stress, which can lead to stress in relationships. The more things a personal injury attorney can take off your plate, the less stress you’ll likely have. A good attorney can help navigate resolution of your property damage, help you find the right medical care, possibly at no out of pocket expenses to you, Best of all, the attorney will deal with the adjuster, so you won’t have to. You can concentrate on getting better instead of dealing with accident related external stressors.